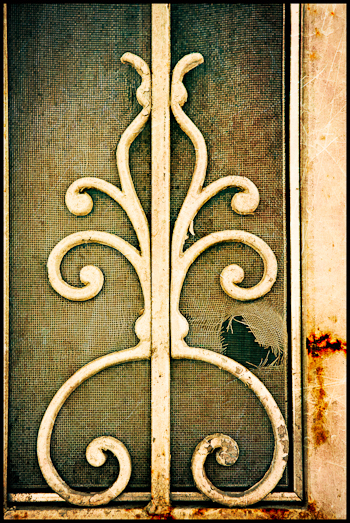 Does Durable Mean You Can Not Have a Decorative Screen Door? A steel screen door just sounds like it would be a more durable then an aluminum screen door; doesn't it? What really makes a screen door durable and maintenance free? But does that mean it has to look like it would survive the roughest pets, kids, or weather? Can a durable screen door actually add to your home's curb appeal? Or frame your beautiful view without obstructing it? If you live on the ocean, a steel screen door will be strong. That is until the continual salt spray starts to wear off the paint after 800 to 850 hours. Then it will start to rust. You will notice it starting when your beautiful white screen door starts to look yellow in the corners, and the paint will start to bubble. Before you know it, you are trying to get the tiny wire brush in to clean the rust away and spray with Rust-O-Leum. Let's not even get into what it is like to try to paint a screen door. Leave the rusty doors to the artists. It's not just the rust that will get to your door, consider the cold and wind as well. If you live in an area known for high winds, or cold temps, that can also weaken a painted steel screen door. The first thing to fail on most screen doors are the screen. With kids running through the house, one hard push on that screen and POP! Out comes the screen, or worse, a hole in the screen. Ask about the screen and what kind of use it can stand up to. If your pets are a part of the family, they can come and go as they please with a pet-friendly aluminum screen door. Make sure the the pet door is built into the frame of the screen door and that it can be locked. Otherwise you may end up with a screen door with a huge hole in it, then anything can come and go as they please! Durable and decorative screen doors should also be secure. Make sure that your screen door has a security lock system. Looking for some help finding a reliable contractor in your area that can help you find the best durable and decorative screen door? We will help you find one in your area!